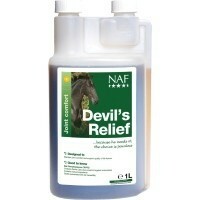 NAF Devil’s Relief has been formulated to help ease stiffness associated with limited flexibility; particularly older horses. Devil’s Relief contains a bitter herb native to Africa called Devil’s claw that will actively target stiffness directly. Its bitter properties also helps to stimulate the digestive system of your horse, aiding digestion and absorbtion of nutrients. Devil’s Relief can be fed to all horses and ponies with the exception of pregnant mares.